The Green Revolution was a huge success especially in cereals and had a tremendous impact on food production, socioeconomic conditions, and environmental sustainability. However, this success story seemed incomplete since Green Revolution created islands of prosperity in vast stretches of low productive areas. To mitigate this problem, participatory plant breeding was conceived and extensive work carried out in this new field. PPB is extremely advantageous in those geographic areas where classical breeding efforts have been less successful and failed to leave a positive impact on farmers’ conditions. PPB can be resorted to for multiple uses like increasing productivity, preserving diversity and benefits for specific end users. However, most of these goals are not mutually compatible leading to trade-offs when any one option is given priority. 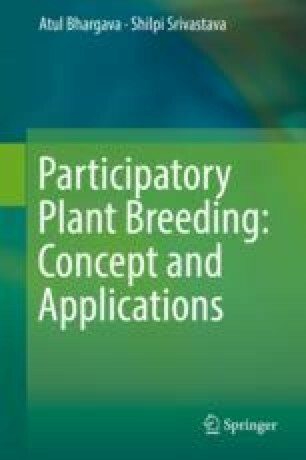 Participatory approaches have certain limitations when compared to the conventional breeding methodologies especially the cost that is sometimes exorbitant and lead to selection of conventional methods as way of improvement. Thus, it is important that one should have total clarity regarding the objective of participatory research as to whether it is being used for improving the efficiency of agricultural research or merely being used as a tool for empowering farmers or partner organizations. Plant breeding institutions need to focus on the functional components of participatory breeding along with the empowerment of intermediate/partner organizations rather than the direct empowerment of large numbers of farmers.